Indian girls are famous all over the world for their unique beauty. Their striking exotic features which are very different from white, Black or East Asian features. India is a kaleidoscope of many races including Caucasians (Aryans), Mediterranean, Mongoloids, Dravidians, Australoids. Inhabitants of Andaman and Nicobar Islands are closely related to the Black race. Over the 5000 years of continuing civilization history these races have mixed together to produce a very eclectic mixture of cultures and of course beauty. India has the second largest diaspora population in the world and they have achieved great success everywhere in the world. 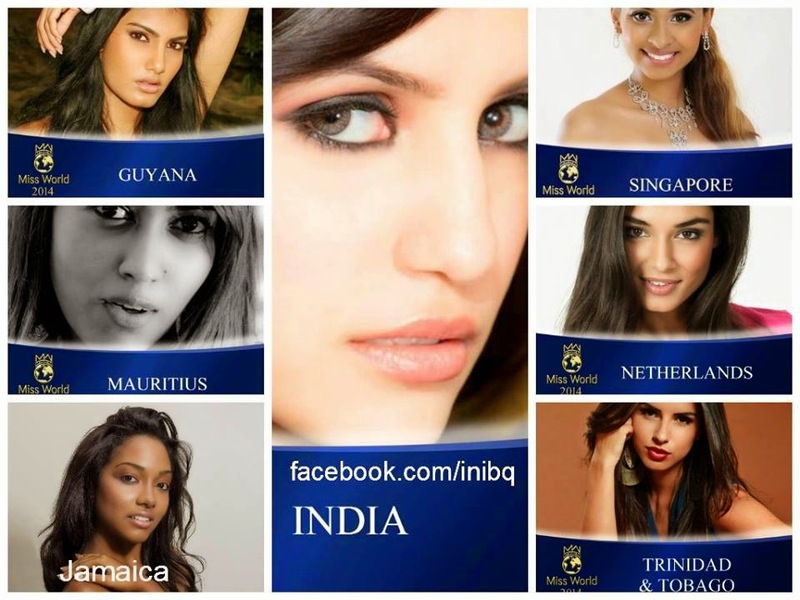 This year Miss World 2014 Competition had 7 Indian origin Beauties, 2 penetrating Top 10, India and Guyana. Last year 5 Indian origin beauties competed at Miss Universe. At Miss Universe 2010, 2 of the TOP 5 were of Mixed Indian origin, Jamaican Yendi Philips and Filipino Venus Raj. India has produced great and memorable beauty queens. Aishwarya is a legend and so far the most successful Miss World ever. Sushmita and Lara Dutta are remembered for their answers which are rated amongst the best at Miss Universe ever. Lara score a score of 9.9/10 at Miss Universe 2010 which is highest ever. India is also the Only Country to win Miss Universe and Miss World both in the same years twice, 1994 and 2000. It is also the only country to score a back to back victory at Miss World by winning in 1999 and 2000. India won Miss World 3 times in 4 years itself speaks the power of Indian beauty and Brains. With 7 Big 2 crowns (Miss World and Miss Universe) India enjoys a very respectable position in the pageantry. With 7 Big 2 crowns (Miss World and Miss Universe) India enjoys a very respectable position in the pageantry. This performance is commendable as the there was never a huge popular support from the Indians in general. This year India has won Miss Supranational, Third after Miss Universe and Miss World in terms of production quality. Also India won 3 other minor crowns this year. Indian beauty is certainly on roll. In 2000 India won 4 major pageants, Miss Universe, Miss World, Mrs. World and Miss Asia Pacific. Let’s have a look at their profiles of Indian contestants this year. Miss World 2014 which happened at London in December had 7 Indian origin beauties. 2 of them Miss Guyana and Miss India reached Top 10. Indian beauty stands in a league of its own as unmatched as our women are.